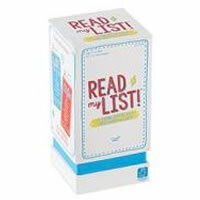 Read My List is a quick thinking game where players listen to a list and remember what you heard. Three different possibilities exists: racing to name things that fit in a category, guessing the correct category for the given things or a free for all in the lightning round! You'll be scratching your head trying to remember things in this fun card game. Read My List needs at least three players and works best with children 8 and older up to adults. Playing doesn't take long and learning how to play is a breeze. Check out more about this game pick yours up today. The first player to earn 5 points wins. You'll get 200 cards and the official Read My List game rules and instructions. Please keep in mind that the official Read My List dice-card rules and instructions could be different depending on the game version you have. The rules below are some of the exact directions on how to play Read My List. Share with us your comments, funny stories, tips, advice, strategies, creative ways to play, questions about how to play, problems with the rules or anything you want about Read My List. All submissions will be reviewed within 24 hours. Click here to add your Read My List comments.